Perrin – Wanna Get Published, Write! 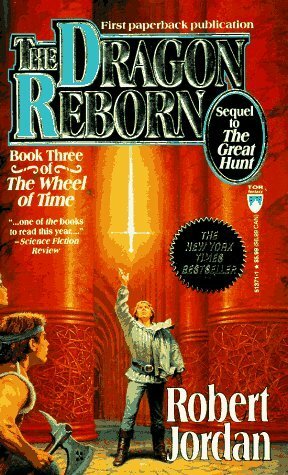 Review: As the fourth book in The Wheel of Time series opens right after Rand Al’Thor has drawn Calandor and taken the Stone of Tear along with Aiel. Each of the three ta’veren are attacked by animated inanimate objects…Rand, while Berelain, the First of Mayene, is coming on to him, Perrin while he and Faile are having a chat, and Mat, while he’s playing cards with some young nobles. All three survive their encounters without significant damage and without killing anyone else, but it does shake them up a bit. News of Whitecloaks in Two Rivers looking for them makes Perrin decide he has to go back to help. He’s convinced that if he turns himself in, they’ll leave Emond’s Field and the rest of Two Rivers alone. He, Faile, Loial, and a few Aiel take The Ways back to a waygate near the Two Rivers. They find the villagers trapped between the Whitecloaks and trollocs…one group just more overt about the suffering and despicable acts they perpetrate on people wherever they go. Perrin turns out to be a natural leader, although he constantly doubts himself. Elayne, Nynaeve, Egwene, and Moraine get the the captive Black sisters to admit that the Black Ajah has fled to Tanchico. Egwene is able to confirm this by dream walking. In that same visit to Tel’aran’rhoid, she also meets an Aiel Wise One who tells her to come to the waste and she will train her in dream walking. Elayne, Nynaeve, Thom, and Julian, the thief-catcher, head to Tanchico aboard a Sea Folk vessel where they befriend the Wavemistress and Windfinder of the vessel. Mat and Rand, along with Moraine and Lan, Egwene, and Aviendha, as well as the rest of the Aiel who took the Stone, head to the Aiel waste beyond the Dragonwall via a portal stone. Once in the Aiel waste, Rand goes to Rhuidean, presumably because he read that he needs to in one or more of the many books on the prophecy he read while in Tear. Mat also goes because people in a ter’angreal told he must or he would die. In Rhuidean, Rand learns a lot of the history of the Aiel and Mat is almost killed, but returns with a fox head medallion and the broken head of a black spear carved with runes…and quite an extensive knowledge of the Old Tongue. Rand shows his double golden dragons at Alcair Dal, declaring himself “He Who Comes With The Dawn”…the man prophesied to unite and to break the Aiel …which begins almost immediately after his declaration, followed by a confrontation with one of the Forsaken. 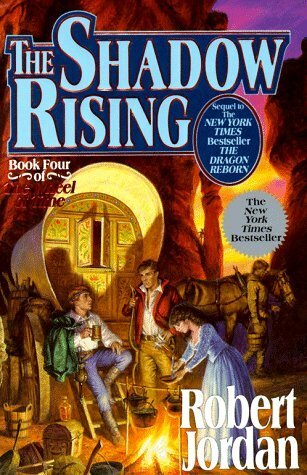 Bottom Line: While the pacing may have backed off a little and it may have the highest page count of this series, The Shadow Rising is full of important information and events, and isn’t too slow …even on a reread. To say it’s full of life changing events for many of the main characters would be an understatement. A bit of foreshadowing is also thrown in that can easily be missed as such without knowledge of the rest of the story. Very clever. It helps provide an “ah, ha” moment for those on a reread. 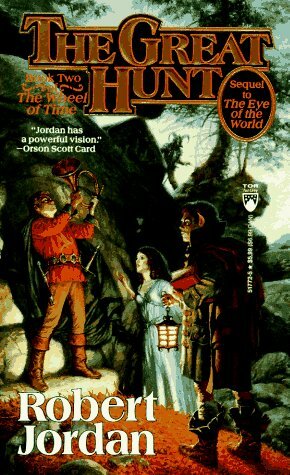 Review: As the third book in The Wheel of Time series opens, Rand Al’Thor, after days of arguing with Moraine Sedai, leaves during the night, forcing Moraine, Lan, Perrin, and Loial to try to track him…which leads them through many towns where his passing has caused extremely odd things to happen. In one town, Perrin frees an Aiel named Gaul from a cage and a Huntress of the Horn named Zarine decides to tag along as they flee the town by river after Perrin and Gaul slay/defeat twenty Whitecloaks. They are chased out of Illian by Darkhounds and Gray Men and arrive in Tear. Nynaeve, Egwene, and Elayne bring Mat and the Horn back to Tar Valon. The girls are raised to Accepted and put on secret assignment by the Amyrlin Seat to search for members of the Black Ajah. Mat is healed, his connection to the dagger from Shadar Logoth broken, and he is told that he is effectively a prisoner of the White Tower, until a scheme of Elayne, Egwene, and Nynaeve allows him to escape downriver with Thom Merrillin. Due to his unnatural good luck, he and Thom survive a couple of encounters on the way to Caemlyn, where Mat overhears a plan to kill Elayne, Egwene, and Nynaeve. He and Thom then make tracks for Tear. All our parties converge on Tear and the Prophecies are fulfilled: Rand wields Callandor and proclaims himself The Dragon Reborn! Bottom Line: Changing gears a bit, The Dragon Reborn spends more time building the characters and story of the girls, Mat, and Perrin. Most of Rand’s face time is through other characters’ points of view this time. It also provides quite a bit of foreshadowing and name recognition that has come with having read the entire series previously…some of those moments where a character is introduced, almost in passing, that I know has a much bigger part to play later…that when I read them in here now, I think “Oh, wow…I didn’t recall <insert name> being introduced here.” I love those moments during re-reads. Another great book. Review: With a double meaning, The Great Hunt is a prefect title for this book. The Great Hunt of the Horn has been a gleeman’s tale for generations and it describes marvelous Hunters heeding Illian’s call to search the land for The Horn of Valere, fabled to call dead heroes back from the grave. It’s an epic story that tavern goers love. The more pertinent meaning, though, is Rand’s, Perrin, and Mat’s pursuit of Padan Fain and items he steals during a raid by Trollocs on Fal Dara during the Amyriyn Seat’s visit: the dagger Mat took from Shadar Logoth and the Horn of Valere, recovered during the climax to The Eye of the World. Riding along with “Lord Rand,” as many folks have taken to calling him because of the way Moraine has adjusted his wardrobe, and the group is a contingent of Shienarans including one-eyed Uno, ever-mistrusting Masema, and headed-up by Lord Ingtar, charged to recover the Horn. Rand, Loial the Ogier, and the ‘sniffer’, Hurin, get separated from the group one night by unknowingly sleeping too near a portal stone which takes them to an alternate world. Here, Rand rescues the unnaturally beautiful Selene who helps them get back to their world, steal back the chest with Horn and dagger from Fain, and flee to Cairhien, before disappearing. In Cairhien, Lord Rand is drawn into Daes Dae’mar, the Game of Houses, against his will while also trying to dodge Darkfriends and Trollocs who have infiltrated the city. Perrin, Mat, Lord Ingtar and Verin Sedai arrive in Cairhien just after Fain has retaken the dagger and Horn. This time, though, he leaves a message telling Rand that he’ll be waiting for him on Toman Head…a land far to the west. When the ta’veren headed off to pursue Fain from Fal Dara, Egwene and Nynaeve head to Tar Valon to begin training to become Aes Sedai. Based on her age and ability to channel the one power a bit, Nynaeve is allowed to test and becomes Accepted shortly after arriving in the city, leaving Egwene a Novice and stuck with a roommate…who just happens to be Elayne Trakand, the daughter-heir of Andor who Rand encounter on his way though Caemlyn in The Eye of the World. Egwene and Elayne immediately hit it off with each other, as well as with Min, another young girl visiting Tar Valon, not to become Aes Sedai, but because Moraine is interested in learning how her ability to see auras around people works. Rand and company arrive in Falme and, thanks to Mat’s affinity to the dagger, quickly locate the Horn and dagger. The party enters the home of a Seanchan High Lord and lay their hands on the items before being discovered by the High Lord. Rand wins his first fight against a real blademaster and the group escapes…just as Nynaeve and Elayne put their rescue plan into action where they learn that not only can the leashed ones channel, but also the leash holders. With Egwene and Min rescued, they head for the docks to escape by ship. Trying to flee Falme, Rand, Perrin, and Mat decide to use the Horn to help escape the Seanchan so Mat blows it, calling forth the dead heroes of the ages to aid them. While the battle rages, Rand finds himself facing off against the Dark One again, this time sword vs. staff, their fight displayed in the skies above. Rand eventually allows himself to be impaled his enemy’s staff so that he can strike the killing blow. Spurred on by Rand’s victory, the dead heroes drive the Seanchan back to the sea. Bottom Line: Jordan continues with great pacing and continues a pattern of splintering then reuniting the group of main characters. We’re introduced to a couple new cities/realms and we see the Dark Ones reach getting stronger as more of his agents begin to exert influence on the main characters. It’s another great book and pushes the plot along well. Long live The Dragon! Review: The first book in The Wheel of Time series, The Eye of the World introduces us to all of the main players in this book in the first few chapters. We meet Rand, Perin, and Mat, Egwene and Nynaeve, Moraine and Lan, Padan Fain, and Thom the Gleeman in Emond’s Field of the Two Rivers. Shortly after we’ve met everyone, Rand and his father, Tam, are attacked by trollocs at their farm outside of town. Tam gets injured so Rand takes up his father’s sword and manages to get them both to town, which had also been attacked in the night. The attack had been repulsed by Moraine, who has now been revealed as an Aes Sedai, the “magic” wielding folks of this world. The boys, Rand, Perrin, and Mat, as well as Rand’s not-quite-girlfriend Egwene, leave the town with Moraine Sedai, her Warder, Lan, and Thom because Moraine convinces them that the trollocs were there for them. A grand adventure begins with the group pursued by the minions of The Dark One as they flee with the intention of heading to the Aes Sedai stronghold of Tar Valon. Naturally, the group gets split into smaller groups that each have unique encounters before finally being reunited in in the Borderlands rather than Tar Valon. From the borderland stronghold of Shienar, the group rides into the Blight to find The Eye of the World, where Rand first channels the One Power, proving to Moraine what she had suspected…he is The Dragon Reborn. Along their journeys, Rand, Perrin, Mat, and Egwene, and even Nynaeve to a degree, do a bit of growing up, learn how much bigger the world is outside of their beloved Two Rivers, and begin to discover things about themselves that they had never dreamed of before. Talking with wolves, channeling, meeting a queen and her daughter and son, fighting and fleeing from Darkfriends, losing friends, and trying to save the world become part of their lives. All of this in this one book. Deftly woven in an engaging tale that has a satisfying end while also serving as the beginning to an epic story that will challenge and change all of the characters. The characters are multi-dimensional, complex (or on there way to it), and believable…some more likable that others. The settings are rich and each realm/country/society is uniquely defined by its styles and attitudes. The level of detail is actually one of the aspects pointed out as a problem with this series. Too much, too frequently, which can slow down the story. Luckily, this book isn’t bogged down by the descriptions. It clips along nicely to the climax. Bottom Line: If you’re a fantasy buff and haven’t read this, you have got some reading to do. This series is richly developed with great characters. 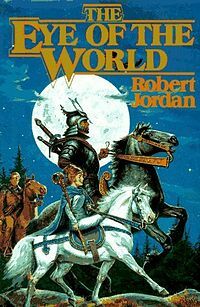 Give The Eye of the World a read and see if you aren’t hooked on The Wheel of Time, my favorite series. This is my fourth reading of this book.